Professional sprinkler system installation and repair in Dallas-Fort Worth, TX, feel free to give us a call at 817-396-0125. MDM Landscapes are the experts you can trust! Our team has more than 25 years of experience and guarantees your complete satisfaction. Contact us today! Sprinklers are a great solution to the time-consuming problem of lugging an old traditional sprinkler around each section of your lawn each week. An underground sprinkler system is worry-free and can help conserve water by ensuring a uniform distribution across your lawn. Sprinkler systems can even be programmed to operate on a schedule, and the watering duration can even be determined by most control systems. Sprinkler systems depend upon a flow of water, and a certain amount of water pressure. Water pressure is the most likely factor to lead to sprinkler system failure. Even with an adequate flow of water, a lack of pressure will lead to an inoperable sprinkler head. For more information about sprinkler system installation in DFW, give us a call! Water can lose pressure as it travels through various valves, pipes, and meters in your home and lawn before reaching the sprinkler, and it’s important to ensure there remains a sufficient amount of pressure as the water leaves this network of backflow preventers and inlets. If there’s not enough water pressure to allow the sprinkler head to operate properly, you may not even think there is water flowing at all. When installing any sprinkler systems, we understand the need for correct pressure, and we will be sure to use the proper pipe sizes and types of valves to ensure as little pressure as possible is lost. Our professional sprinkler system design will guarantee adequate pressure for flawless watering every time. We can also ensure your sprinkler system is in great shape with our irrigation management. By properly designing and installing your sprinkler system, we can control how much pressure is lost between the point where water enters your property and the point where it leaves the sprinkler. We also have a variety of sprinkler heads available to ensure the best watering mechanism possible for your property. Call our office today when you want sprinkler system installation in Dallas-Fort Worth, TX. Gear-Driven Rotors – These are common for larger operations. Gear-driven rotors employ nozzles equipped with a motorized drive mechanism which can propel the water up to 55 feet. Impact Rotors – Impact rotors are another commonly used sprinkler system seen in use for small commercial properties. Their range is typically greater than pop-up sprinklers, and their rather simplistic design makes them easy to produce and reliably durable. Large Turf Rotors – These are similar in design to impact rotors, but require much more water flow and a greater amount of pressure. They can be seen on many golf courses delivering water as far away as 100 feet. Pop-Up Sprinklers – Pop-up sprinkler heads are one of the most common types of sprinkler heads for whole residential developments. The pressure forces a nozzle up from its housing and sprays a continuous stream of water across an area. Their range is generally less than impact rotors or large turf rotors, but their low-profile design makes their impact on your landscape’s aesthetics minimal. 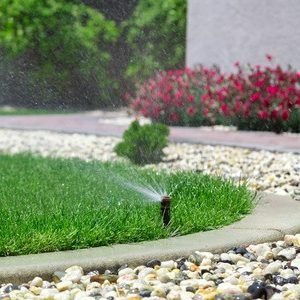 If you need professional sprinkler installation and repair in Dallas-Fort Worth, TX or landscape design, please call MDM Landscapes today at 817-396-0125! We can ensure you have a great sprinkler system for your commercial property, apartment complex, or residential development. Updated on March 6, 2019 at 4:48 pm by MDM Landscapes.